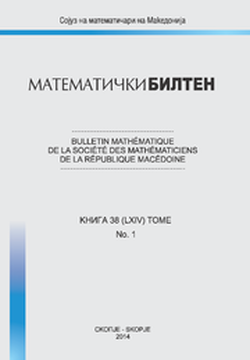 BULLETIN MATHÉMATIQUE DE LA SOCIÉTÉ DES MATHÉMATICIENS DE LA RÉPUBLIQUE MACÉDOINE is the oldest mathematical journal in Republic of Macedonia. It was founded by the Union of Mathematicians and Physicists of Macedonia in 1950 as Bull. Soc. Math. Phys. Macédoine. Since 1991 it is indexed as Matematichki Bilten (Mat. Bilten). This journal is devoted to pure and applied mathematics. It covers practically all mathematical areas, namely, algebra, analysis, graph theory, topology, measure theory and integration, probability theory and mathematical statistics, mathematical optimization, differential equations and dynamic systems, etc. The journal receives only papers that have not been previously published and are not sent for publication elsewhere. As a respectful international mathematical journal, it publishes only original articles with complete proofs by assuring a high quality reviewing process. The quality of the journal is guaranteed by prominent members of the Editorial Board from the whole world. Since 2014 appears twice a year. BULLETIN MATHÉMATIQUE publishes original papers of all branches of mathematics and its applications. Contributions are in Macedonian language or in English, French, Russian or German. Short summary in one of the above languages is obligatory if the paper is written in Macedonian. Papers, in two copies, should be typewritten on computer and double-spaced, not exceeding about ten pages and include a short summary in one of the above languages if written in Macedonian.